While filters used to be a mainstay of photography, they are used less and less in digital photography. But the MagFilter System hopes to change that by bringing easy filters to your compact camera. The MagFilter System comes in a variety of sizes to suit cameras including the Sony RX100 or Canon S100 and consists of a magnetic ring which attaches to the end of your lens and then magnetic filters which pop on or off. 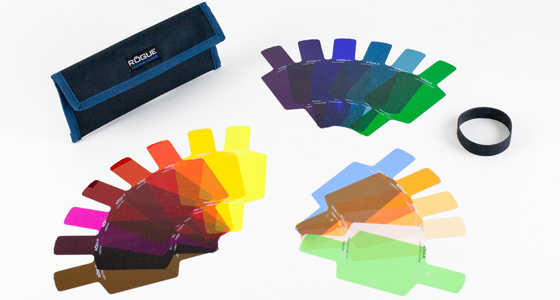 Current filters on offer include polarizing filters and neutral density filters. A spokesperson said: "The revolutionary Carry Speed MagFilters provide the most innovative and unobtrusive filter solution to high end compact cameras. The Hero range of action-cameras have been popular with extreme sports aficionados for a few year now, and their latest camera, the Hero 3 looks sure to continue the trend. The Hero 3 is said to be 30 percent smaller and 25 percent lighter than its predecessor, but this hasn't impacted what it is capable of, not by a long way. Three versions of the Hero 3 offer a variety of specs, but it's the top of the range black edition which is the most interesting. In addition to shooting 1080p60 Full HD video, the camera is capable of 2.7k and 4K resolutions albeit at lower frame-rates. 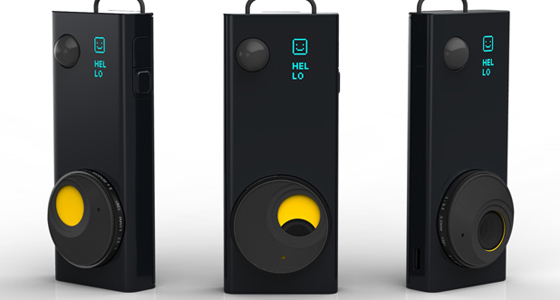 A hands-free camera which is worn around the neck and uses a host of sensors to automatically decide what photos to take is set to go on sale. Autographer uses five on-board sensors and GPS capability to identify the perfect time to take a photo, based on changes in light and colour, motion, direction and temperature, and then snaps away using a wide-angle lens. For instance, Autographer might capture an image when the wearer speeds up as they run for the bus, moves from a warm pub to a snowy street or turns around to greet a friend. Lensbaby has been offering selective focus lenses for a few years now, but now they hope to take it to the masses with the launch of the more affordable Lensbaby Spark. Geared more towards young photo enthusiasts the Spark is available for Canon and Nikon DSLRs and lets users create images which a sweet spot of focus surrounded by blur. The $80 manual focus lens is activated by photographers squeezing to focus and then tilting to move the "sweet spot" around the image. There's no denying that Instagram is having a huge impact of photography. 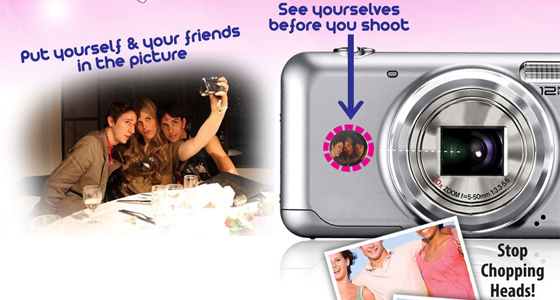 The filter-based photo service has become one of the most popular ways to share photographs. The problem is that this sharing has so far been limited to mobile phones and links on social networks … enter the Instacube, a digital photo frame for Instagram. 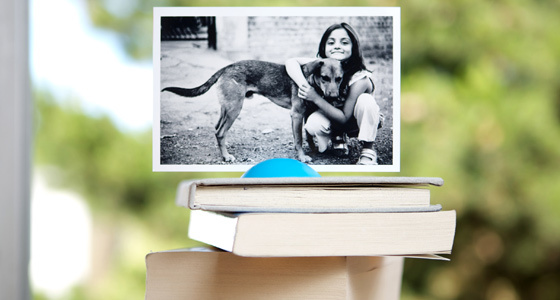 Currently looking for funding on KickStarter, the Instacube is a retro-inspired Android photo frame which connects to your wireless network and accesses your Instagram feed. While some cameras come in a variety of colours, others are only available in black. 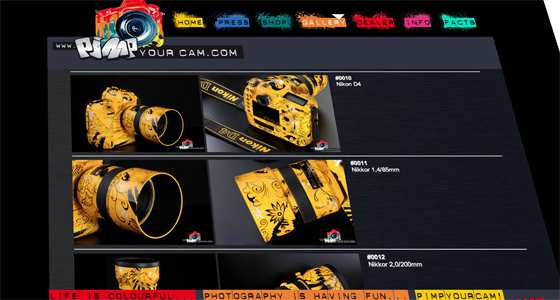 But the guys at PimpYourCam.com think you should have more choice. That's why Jens Brüggemann and Torsten Rachu teamed up and are now offering to create bespoke pant jobs which turn your camera from a photographic tool to a work of art. They have already worked their colourful airbrush magic on cameras including a Nikon D4, a Nikon1 J1 and a Canon 70-200mm lens. We've seen some interesting camera bags in the past, but this has to be the most bizarre. 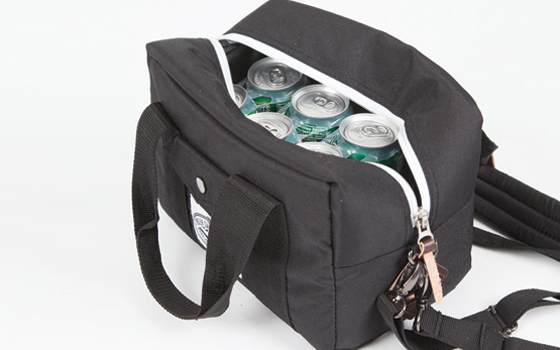 The Camera Cooler is a DSLR camera bag which also doubles as a cooler bag for your beers. 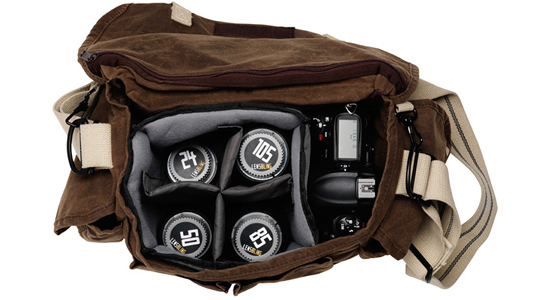 While the US$50 bag features a padded insert that can hold a DSLR, a lens and other small accessories, when you've finished your shoot this can be removed to leave you with a cooler bag plenty big enough for a six-pick of beer. A spokesperson for online retailer PolarStuff.com said: "When you feel like partying, take the padded insert out and it's a perfect soft sided cooler sized to hold a six pack or your lunch along with some blue icy packs you can get at any grocery store." The Lomographic Society has released a pocket-sized fisheye camera which it claims brings the iconic warped looking images to the palm of your hand. The Fisheye Baby 110 - which is available in two versions, plastic and metal - produces circular Fisheye shots on 110 format film. 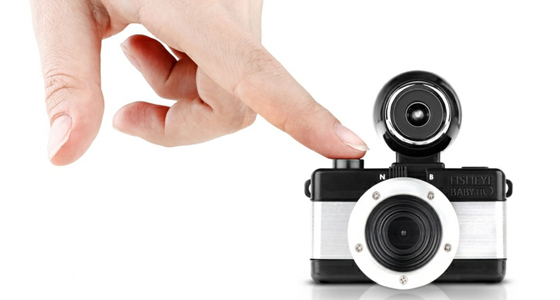 A spokesperson for Lomography said: "This miniature version of the Fisheye No. 2 is packed with the same features—170-degree lens, bulb setting, multiple exposure capability—but can easily fit in your pocket." If you think new DSLR features are just for professional models, think again … Canon have just announced the Canon EOS 650D - a DSLR which boasts an articulating three-inch touchscreen on the rear. 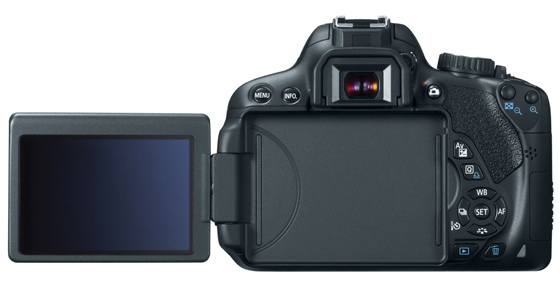 The Canon EOS 650D (the EOS Rebel T4i in the US) has a 18-megapixel CMOS (APS-C) sensor, can shoot 5 fps and has sensitivity range of ISO 100-12,800 (extendable to ISO 25,600). Lensbaby have some pretty cool products, in the past we've raved about their Sweet 35 and various selective focus tool -- but we've always seen them as fun rather than work. That could be changing soon though, after they released Pro Effects Kit, a bundle of their product which combine to make a unique tool to aid your creative photogrpahy. 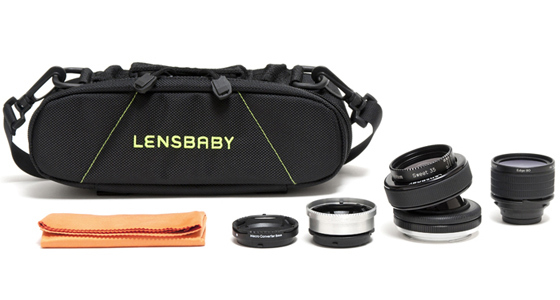 A spokesperson for Lensbaby said: "This versatile kit provides a selective focus system solution for whatever type of photography you're shooting. From portraits and weddings to landscape and commercial photography - this kit is the top choice. We all know what it's like, you're under pressure and need to reach for the 85mm, but looking into your camera bag all you see is a collection of black lens caps. How do you know which is the right one? Well the guys over at BlackRapid have come up with a solution, LensBling rear lens caps which have the focal length of lens printed on the back in bright and bold numbers - it's so simple we wonder how it hasn't been done before. A spokesperson for BlackRapid said: "The caps’ bright, bold and raised labeling that allows easier visibility. The numbers on the lenses represent the focal length of the camera lens, thus putting an end to the struggle to find the right lens, while increasing speed, efficiency, and the promise of capturing every shot." Playing around with lighting and colour is a sure way to add an interesting dynamic to your photos -- which is why the peeps over at Photojojo have started selling a 'Rainbow' flash filter kit. Promising to make quirky lighting easy and fun, the universal flash filter kit consists of 20 flash filters which can attach to any external flash via an included band. While 15 of the colour filters for "adding creative pops of color to your photos" there are others for colour-correcting and canceling out weird ambient light and one which is specially made for diffusion. We've lost more SD cards than we care to think about, sure they sometimes turn up in the bottom of our camera bag, but we're constantly misplacing them. And those people at Think Tank must have the same problem -- because they have just released the SD Pixel Pocket Rocket, a compact carrier for 9 SD memory cards. The wallet-like holds your memory cards in clear pockets and the SD storage can also be tethered to your bag for a added security. Self portraits can be some of the most difficult to take, what with not being able to see yourself in the viewfinder when you are in front of it. But the guys over at Argraph have come up with an obvious, but ingenious, solution… a mirror which sticks to the front of your camera. Mirror Mirror is a small reflective dot which is designed to be stuck close to your lens, so that if holding the camera out to take a photo of yourself, you can see what the lens sees. Almost everyone shoots with a digital camera nowadays, so it's easy to forget how comfortable analogue cameras were… wait what? 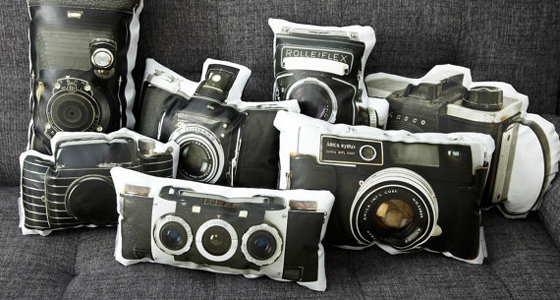 A US-based Etsy seller is selling an impressive range of pillows in the shape of classic cameras. So for around £20 to £30 you get to own a Rolleiflex, Pocket Kodak or Ansco and while you won't get to take photos with it, it could make your sofa a bit more comfortable. We know you love photography. You know you love photography. But do people using your toilet know you love photography? Well they will if you buy this 'Film Paper Towel Box' from Brando.com! The bizarre bathroom wear is essentially an enlarged film container -- complete with label -- which can be used as a loo roll or tissue dispenser. Sure you could just add Instagram-style filters to your iPhone snaps, but Holga don't want you to do that, they want you to use a retro-style filter wheel. And because of this they've just released a iPhone 4 (or iPhone 4S) case with a built-in rotating filter wheel. The case -- which is available in five different colours -- offers 9 different and crazy special effects and filters without the need for an app. Any photographer knows that getting your focus spot-on is one of the most important things when taking an image… or at least is was. That's because a revolutionary new camera is being released which allows you to focus your images after you have uploaded them to your computer. The Lytro Digital Camera works by capturing the entire light field -- rather than a single plane of light -- including colour, intensity, and direction of all the light. Sometimes the best way of displaying a photo is the most inconspicuous way -- which we think must make these snapshot dots great! Made from food-grade silicone, the colourful little round dots have a central grip which can be used to hold your photos without having to fold, bend or stab them with a pin. This means they can bring your favourite photos frame-free to shelves, tables… anywhere you've got a horizontal surface.